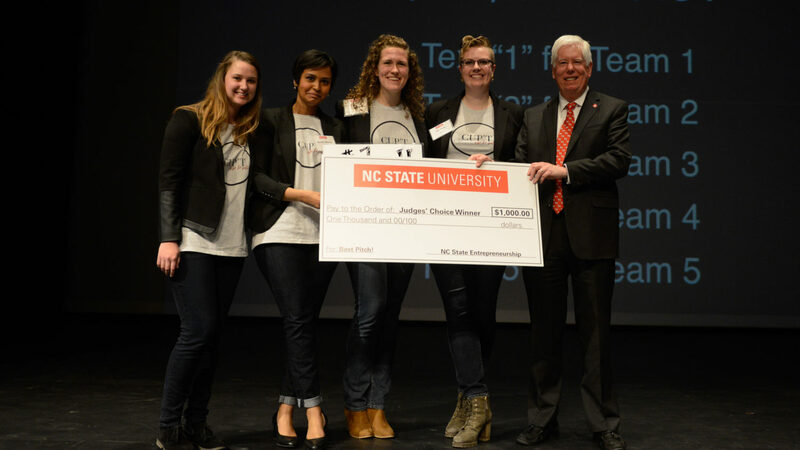 On Thursday, April 5, over 500 people gathered in Stewart Theatre to see the next generation of entrepreneurs at the Lulu eGames LIVE, NC State’s annual startup competition. The winning teams emerged from 178 entries and were chosen by a panel of judges from two rounds of competition. The final winners were selected based on combined scores from a business plan and in-person pitch. We’re excited to recognize these teams for all their hard work! Special thanks to our emcee, Renee Chou from WRAL-TV. 1st, $10,000: Tuéri | Tuéri is a company focused on improving the safety of cyclists through innovative and aesthetic accessories that improves property security and provides a method of communication with motorists. 2nd, $7,000: Aeva | Aeva is designing a solution that speeds up the aging process of alcohol, allowing breweries, distilleries, and wineries to increase profits, experiment quickly, and scale production in real time. 3rd, $5,000: Trashr | TRASHR installs sensors into dumpsters to make the waste collection industry smarter, cleaner, and more efficient. The Design & Prototype category is for student ventures that have an innovative product concept design or prototype. 1st, $5,000: Tuéri | Tuéri is a company focused on improving the safety of cyclists through innovative and aesthetic accessories that improves property security and provides a method of communication with motorists. 2nd, $3,000: HyPower Solutions | HyPower Solutions is energy storage utilizing hydrogen as a source of fuel. 3rd, $2,000: Mitramag Canine | Mitramag Canine is a low-risk, transcatheter implant for surgical repair of the canine mitral valve. The Social and Environmental Impact category is for student ventures using the power of business to solve social and environmental issues. It is held in partnership with the Poole College of Management Business Sustainability Collaborative. 1st, $5,000: Freshspire | Freshspire is a network and platform that connects food suppliers who have excess produce to restaurants who want to buy it at a lower cost. 2nd, $3,000: 321 Coffee | 321 Coffee is a growing pop-up coffee shop that is run by individuals with special needs. 3rd, $2,000: Cup’t | Cup’t is taking customers from size to sale, accurately measuring women’s’ breast size and selecting the best retail options, redefining the bra shopping experience. The Built on Cloud category is for student ventures utilizing one or more of IBM’s cloud services. The category is held in partnership with IBM. 1st, $5,000: Cup’t | Cup’t is taking customers from size to sale, accurately measuring women’s’ breast size and selecting the best retail options, redefining the bra shopping experience. 2nd, $3,000: Vital Guide | The Vital Guide improves workflow efficiency and patient outcomes in hospital emergency departments by providing real-time patient vital signs and patient location to hospital staff. 3rd, $2,000: HyPower Solutions | HyPower Solutions is energy storage utilizing hydrogen as a source of fuel. The Arts Venture category is for arts-based student ventures or student ventures benefitting the arts community. The NC State Arts Entrepreneurship program is a partner for the category. 1st, $5,000: Live! Artist App | Live! Artist App is an all-in-one affordable tour management app for artists. 2nd, $3,000: Wyker Design | Wyker Design is a collection of hand-crafted handbags with a visual identity focusing on individuality and celebrating the power and strength of femininity. 3rd, $2,000: Cup’t | Cup’t is taking customers from size to sale, accurately measuring women’s breast size and selecting the best retail options, redefining the bra shopping experience. The Daugherty Endowment category is for ventures that have licensed NC State technology in the past three years. The category is made possible by the Daugherty Entrepreneurialism Endowment in partnership with the Kenan Institute for Engineering, Technology & Science. 1st, $25,000: VitalFlo | VitalFlo is redefining the standard of care for asthma management by providing actionable insights to patients when they need it most: before they have an asthma attack. 2nd, $15,000: Sentinel Biomedical | Sentinel Biomedical is a group of dog lovers driven to understand the biological and environmental influences of cancer while creating a solution for accurate and early detection. 3rd, $10,000: NExS | NExS Software has developed an online platform that allows users to create custom web applications from spreadsheets with no programming required.